James Casey and Angie Jackson have won the inaugural Central Coast Saltwater Festival on Australia’s East Coast, edging out a star-studded field of world ranked and local dark horse paddlers. Sounds like the inaugural event was a big success, with a well organised weekend of racing, big prize purse and top level talent all supporting a great cause. 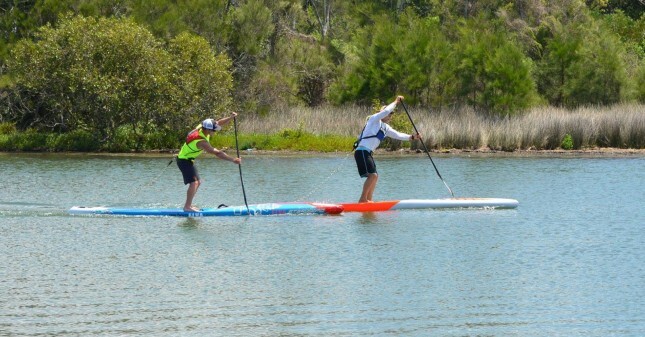 The event, which kind of popped up out of nowhere despite offering a near record prize purse for Australia ($16,500), attracted a who’s who of the Aussie SUP scene, with the weekend comprised of three different races. Distance Race: On Saturday it was the flat water Distance Race, with Michael Booth displaying why he’s going to be a force to be reckoned with next year. In challenging windy conditions, Boothy showed his strong performance at last month’s PPGs distance race (where he went toe-to-toe with Danny Ching, Connor Baxter and Travis Grant) was no fluke, pulling clear of the draft train to finish a minute clear of runner-up James Casey and two minutes ahead of third place finisher Jake Jensen. The pro women’s field was relatively small, however it did feature two of the world’s top 10 athletes: Angie Jackson and Terrene Black. Angie got the better of Terrene by a solid margin on day one, which set the tone for the rest of the weekend. Short Course Race: The second race of the event was a 4km short course race. The short, flat water course kept the lead pack tight, with Molokai charger James Casey winning the five-way sprint up the beach after Boothy dropped his paddle on the sand while in the lead. Dash For Cash: The final event of the weekend was a 100m dash for cash, which was held on 10’6 surf shape boards. Paul Jackson got the better of the elite field over the short distance, narrowly edging out Toby Cracknell while James Casey’s 3rd was enough to seal the overall title. Jacko’s wife Angie once again saluted in the women’s to make it a clean sweep for the weekend and walk home with a total of $6,000. Still trying to muster up the full overall results from the three races combined. We’ll update this post when we get our hands on them. In the meantime you can check out the full results right here. Sounds like a very well run event and hopefully it’ll return next year bigger and better. Great to see prize money starting to reach decent levels in Australia, a nation that’s always had the athletes but has rarely had the big events to showcase that talent. Most of the guys and girls that were on show at the Central Coast Saltwater Festival will be over on the other side of the country next month, where The Doctor and King of the Cut will headline what’s fast becoming known as Aussie Downwind Week. The Central Coast Saltwater Festival was created in support of the Kamira Alcohol and Other Drug Treatment Services, with all profits going straight to the charity.